Spain is home to more than 750,000 Romanians, of which only 230,000 pay into Social Security. Yet little is known about them. In spite of the demand for a workforce in Romania and the moratorium on the hiring of Romanian citizens in Spain, it is not expected that the Romanian residents will return to their country. (From Madrid) EVERY EXILE IS A ULYSSES traveling toward Ithaca. Every real existence reproduces the Odyssey: the path toward Ithaca, toward the Center. These words belong to Mircea Eliade, the great Romanian humanist who, due to the political situation in the first half of the twentieth century, was forced to choose exile with no return. 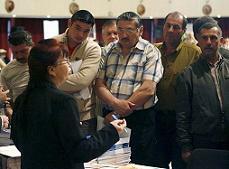 “There are more than 100,000 unemployed Romanians in Spain. The majority of them worked in construction, the sector which has been dealt the heaviest blow by the crisis, but also in the service sector” With the Cold War over, and following in the footsteps of the aforementioned great intellectual exile, the great economic exodus from that same country – Romania – towards the West began within the context of the crisis of the transition towards democracy and a market economy. If at first most emigrants headed to nearby countries, after the Schengen territory opened up its borders in 2002, countries like Italy and Spain became the net receivers of Romanian immigrants, so that, as 2008 comes to a close, there are more than 750,000 Romanian immigrants in Spain, making them the largest foreign group in the country. As a consequence of the never-ending flow of Romanian immigrants, their intense circular labor mobility, their employment in the black market and the effects of the economic crisis, there are more than 100,000 unemployed Romanians in Spain. The majority of them worked in construction -the sector which has been dealt the heaviest blow by the crisis- but also in the service sector. According to the Survey of the Working Population (EPA in its Spanish initials), 448,000 out of the 750,000 are working, although only 230,000 pay into Social Security. And the others? They are living their own time in hell: working in the black market, without any rights or the option of choosing another path. In Romania’s European Union Accession Treaty of January 1, 2007, the member states were allowed to set moratoriums on labor hiring. Spain set one for two years, and now the Spanish government has to decide whether to extend it or not. Romanians are making a positive contribution to the Spanish economy (0.71 percent of the GDP); the immigrants try to assimilate; they learn the language; they have more than a hundred organizations, a mass media, and a very active Romanian Cultural Institute; almost all of their children are schooled; and they even marry outside of their ethnic group. “The Romanian government is now making it clear that in the medium term it needs a million skilled workers”However, we cannot turn a blind eye to the dark side of immigration from this country, which is manifested, above all, in the trafficking of human beings and delinquency. These blemishes – without causing the tension that exists in Italy – tarnish the image of Romanians in Spain, despite the Romanian government’s attempt to improve it through the recent campaign Hi, I’m Romanian (Hola, soy Rumano). Globalization has shrunk distances and given mass media a more important role in international relations, and therefore in the geopolitics of migration in the twenty first century. Romania has gotten closer to Spain. Transnationalism has created networks and increased investments; cultural relations have been strengthened and an incipient bridge uniting the two countries has been built. The Romanian government is now making it clear that in the medium term it needs a million skilled workers, and it has recently launched several informative campaigns directed at its compatriots dispersed throughout the entire Spanish terrain, inviting them to come back home. And this is all taking place against the backdrop of the next parliamentary elections in Romania. There will be a return, but for now, Romanians prefer to wait and build their future on a more secure foundation, rather than just drift. Faithful to human nature, more insistence will be followed by more resistance. Will the moratorium be lifted? The voices of specialists, such as Javier de Lucas, professor of Philosophy of the Right and Political Philosophy in the University of Valencia, point out that not yet… given that the avalanche has still not come to an end, and the Romanians will continue with their mass emigration. They will do it no matter what: with or without the moratorium, and with or without rights – because no one has ever stopped them at the border. It is not possible for citizens of a country that belongs to the European Union to not be able to work freely within its market. In this context, the Romanian government will have to collaborate with the EU in a consistent manner that respects the human rights of anyone roaming in search of a better life, without forgetting that while it is already a country of immigration, it is also a country whose citizens are traversing the globe, headed towards more developed countries in order to receive a fatter paycheck. The opening of an evacuation transit center for refugees in Timisoara in 2008 (funded by the EU to protect refugees against forced return) as one of the main detention centers for illegal refugees, located on the eastern border of the elite club that is the European Union, is not exactly a positive development for Romania, a country that, struggling with immigration and emigration, is still recovering from the dictatorship of the Cold War era. However, Romanians will find their Center on the path toward their country. They will write their own Odyssey, although some with more success than others. Some will remain on the eternal migratory trip, in its perpetual transitoriness; and some will return with more training, more prepared to start anew. But they will all be sure about one thing: migration will have helped them understand, like the stoics, that the world will never again be foreign to them from the moment they find the symbolism of the Center to which Eliade was referring. Those who return, as well as those who stay, will be universal citizens who will live, as Seneca reminds us, with the belief that everyone is his or her own country.